Would you like to know more about the CAT programme's eye-catching lead image (above)? Click here for a full mathematical explanation. Complex analysis is unusual in that it pervades so many apparently disparate areas of mathematics, including analysis, algebra, geometry, algebraic geometry, differential geometry, numerical analysis, spectral theory, integrable systems and the theory of partial differential equations. In recent years, significant advances have been made in some fundamental aspects of the subject, among them the so-called unified transform method of Fokas with its relation to the spectral theory and integrable systems, the development and refinement of numerical methods for Riemann-Hilbert problems with connections to orthogonal polynomials, random matrices and special function theory, and conformal mapping with the discovery of a new constructive framework for deriving mappings for domains of arbitrary connectivity. 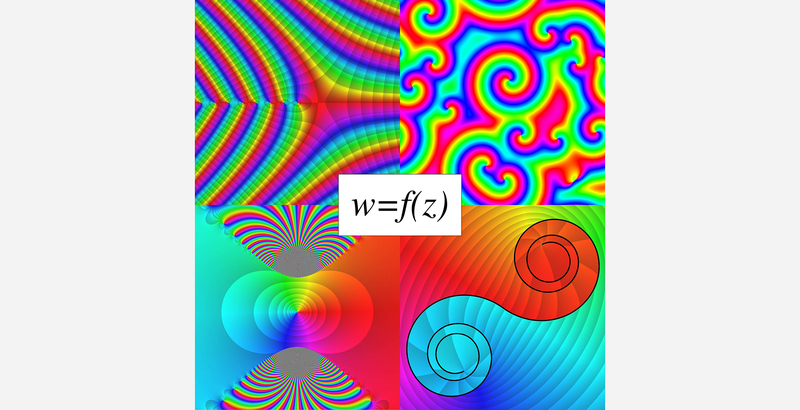 Recent years have also witnessed a surge of activity in related free-boundary problems, largely driven by applications in mathematical and statistical physics, biology and medicine: examples include Laplacian growth, diffusion-limited aggregation, stochastic Loewner evolution, cancerous tumour modelling. Complex variables in numerical analysis is also a topic of burgeoning interest and activity. Complex-domain methods play an important role in the studies of finite-time singularity formation in various PDE problems. These investigations represent an area of increasing overlap between scientific computing and PDE analysis. Many of the newly developed tools of complex analysis also pose computational challenges which need to be addressed before these approaches can be used in real-world applications. This programme is aimed at enhancing these new basic techniques, while assessing their scope and usefulness, and at bringing together key researchers working at the frontiers of these new developments to help steer future endeavours. It takes an integrated view of complex variable theory, computations and applications, and should be accessible to a wide range of attendees from a diverse spectrum of backgrounds. Its goal is to bring together researchers from the mathematics, physics and engineering communities, whose research shares a common theme of using complex analysis to attack real-world problems. In addition to exploring new applications of complex variable theory, the programme will focus on drawing out the unexpected connections between different branches of complex analysis that have been emerging. A key objective of the programme is to engage stakeholders from diverse application areas to learn about, discuss and develop these new methods and applications of complex analysis. The programme's activities will be built around three main interaction vehicles: (1) workshops; (2) masterclasses; (3) ongoing themes and collaborations, linked to various events during each week of the programme. The three workshops are "The complex analysis toolbox: new techniques and perspectives", "Complex analysis in mathematical physics and applications", and "Numerical complex analysis."